Space Shuttle Columbia exploded during reentry due to missing heat shield tiles. When this happened, the shuttle would have had a great amount of speed, which would imply debris was strewn far down range. What was the furthest distance between discovered pieces of the shuttle? 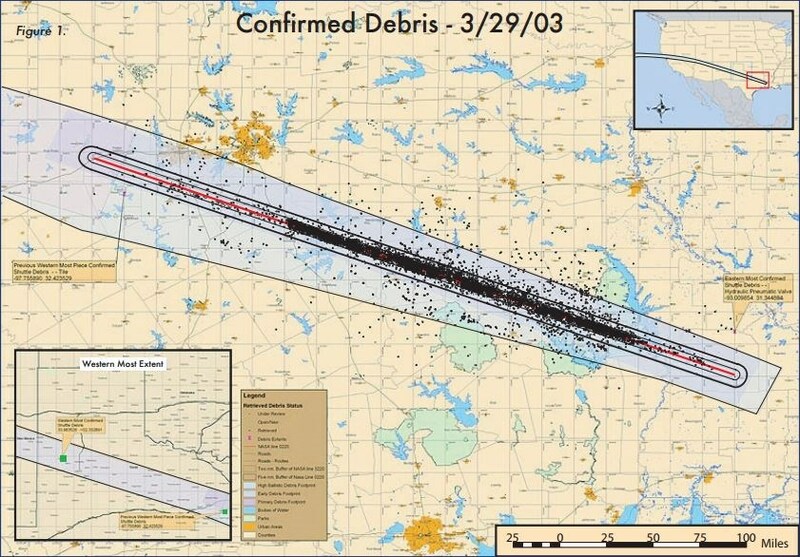 Total length of debris field: 250 miles (402 kilometers). Roughly 400km (250 miles) long and 65km (40 miles) wide. The debris scattered over a large part of Texas, so this is an estimate. One of the comments linked this which includes a picture of all the debris found in Texas. Not the answer you're looking for? Browse other questions tagged debris space-shuttle accident or ask your own question. What, if any, abort options would the crew of Columbia had on reentry during STS-107, assuming they became aware of the damage during that phase?